On Saturday, at the 2018 World Gymnastics in Melbourne Aruna Budda Reddy won a bronze medal in women's vaults. After her two attempts, she came third with a average score of 13.699. Along with her, another Indian, Pranati Nayak managed a sixth place finish with an aggregate score of 13.416 after two attempts. Slovania's Tjasa Kysslef won the gold medal with a score of 13.800, while Australia's Emily Whitehead took home the silver with a score 13.699 in the finals. In the finals, Aruna started solidly, choosing a difficulty level of 4.600 in which she scored 9.066 on execution-- giving her a total of 13.666. 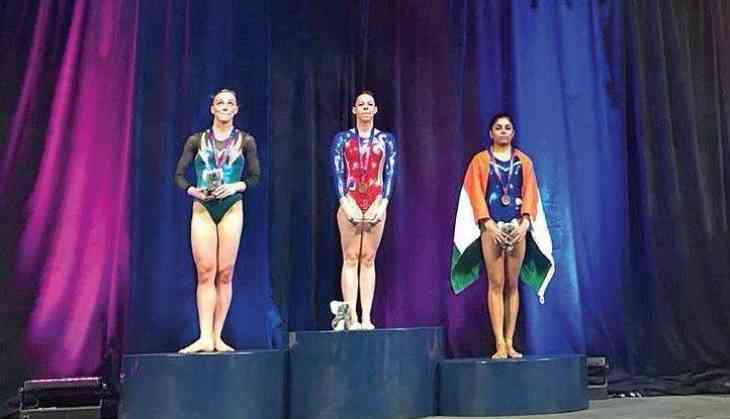 In her second attempt, the Indian gymnast chose a higher difficulty (4.800) but could only manage an execution score of 8.833, which gave her a total of 13.633. After the two attempts, the aggregate of her two attempts were taken, giving her a final score of 13.649. In the qualification stage, Aruna was second after registering a score of 13.566 to reach the finals while Pranati was fourth with an average score of 13.483 after her two attempts. Ashish Kumar had given India its first-ever gymnastics medal when he won a bronze medal at the 2010 Commonwealth Games. Dipa Karmakar also represented India at the Rio Olympics 2016 and became the first Indian gymnast to do so in 52 years. She missed out on an Olympic bronze as she finished fourth in the final.